The European Commission has renewed the UK farming industry’s crucial derogation from sheep identification requirements. This decision follows months of negotiations involving NFU Scotland, the Scottish Executive, Defra and the European Commission. 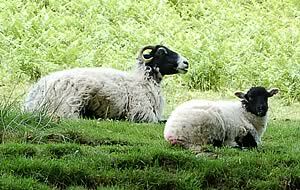 The EU Regulation, first published in December 2002, would have required Scottish farmers to record, with pen and paper, the individual identification numbers of all sheep, every time they move. It would also have required all sheep to be double-tagged at an estimated cost of £20 million a year. NFUS, together with the Scottish Executive, has worked to convince Brussels officials that the current Scottish system, which requires batches of sheep to be recorded rather than individual identification numbers, is effective in delivering all the disease traceability assurances demanded by Europe. As a result of this work and a successful inspection by Brussels officials, the UK was granted a temporary derogation in July 2005. This has now been renewed for a further year following another successful inspection. “I am pleased that we have again managed to secure a derogation from the European sheep tagging requirements, although the welcome is tempered somewhat by the news that it is only a one-year derogation again. “Frustratingly, further changes to our identification system had to be agreed to convince the European Commission that our sheep ID system offers the same level of traceability as those operating elsewhere in Europe. These changes relate to the tagging of sheep for export and the replacement of lost tags within 28 days. I understand the Executive will be writing to all sheep keepers shortly to explain the changes.